Corporate travel is on the move as new technology and savvy travelers drive the industry in a digital direction. 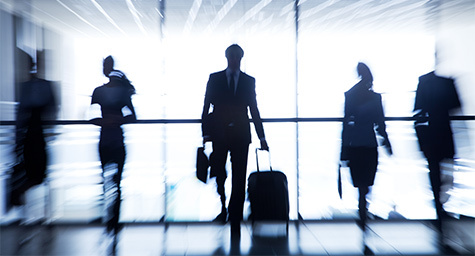 Today’s business travelers mean business as they increasingly search for affordable rates and on-the-go convenience to accommodate their travel needs. As a result, hospitality brands must stay aware of these trends in order to keep corporate travelers’ business. These top corporate travel trends were the focus of the Travelport APAC Customer & Partner Conference in Bali, and WebInTravel.com featured ways to make them work for hospitality brands. 1. Technology Updates Travel – New technologies have worked their way into corporate travel and they’re changing travelers’ browsing and buying behavior. Around 25% of all corporate travel transactions will be made via mobile by 2017, so hospitality brands need to optimize their online properties to facilitate viewing of their travel properties. 2. Mixing Business with Pleasure – One of the biggest trends in corporate executive travel is the extension of business trips into leisure travel. Travelers are making the most of their business trips by lengthening them to include leisure time. 3. Travelers are Moving Faster, But Spending Slower – Advances in video conferencing are enabling travelers to spend less time and less money at travel destinations, which is making their visits less valuable to hotels. 4. From Business Class to “Budget” Class – With companies trying to keep costs down, many are downgrading their business class tickets to budget-friendly fares. So hospitality brands need to bring down their rates in order to keep bookings up. 5. Visibility of Pricing Drives Decisions – The bottom line has become a top priority. As a result, a clear view of value is now critical to catch and keep a share of the market, especially since purchasing decisions are being based on the balance of profits versus value. 7. Metasearch Finds Deals for Travelers – Metasearch is having a major impact on the “unmanaged” segment of corporate travelers. This price-sensitive group appreciates how metasearch eases and expedites the travel-planning process by seeking the best travel deals on a variety of search engines. As corporate travel evolves with our high-tech times and tendencies, hospitality marketing professionals must stay on top of the latest trends to make business travelers reserve and return. Check in on what’s happening in hospitality marketing. Contact MDG Advertising today at 561-338-7797 or visit mdgadvertising.com.